The chain of events set into motion by the U.S. invasions of Afghanistan and Iraq is reaching its logical conclusion -- the disintegration of multi-ethnic states and a great expulsion of innocents. After midnight on August 15, 1947, India and Pakistan became separate countries. The history of population transfers is not a pretty one. During World War I, the subsequent collapse of the Ottoman Empire, and an ensuing three-year conflict between Turkey and Greece, as many as 1.5 million Greeks living in Anatolia died in a horrific campaign of ethnic cleansing. The official population transfer of 1923, unlike what happened later during the partition of India, was an attempt to avert further horrors rather than cause new ones. As a result, Turkey expelled much of its Christian Greek population (1.5 million) and Greece kicked out its Muslim population (500,000). Though the scale of death during this exchange was lower than in India, the human suffering was still immense, and communities of ancient lineage disappeared overnight. The South Asian and Balkan population exchanges were largely based on ethnicity and religion. But occasionally ideology has compelled people to flee in one direction even as other people are running in the other. After the Russian Revolution in 1917 and the victory of the Red forces in the subsequent civil war, the losing Whites left in droves from the Soviet Union, as more than a million people established large émigré communities throughout Europe. The revolution also attracted people who wanted to experience life in a communist state, though the inflow was much smaller in comparison. Today, the Middle East is witnessing a large-scale population transfer, the third major one in the region over the last century. Religion and ethnicity play a significant role in the displacement. But ideology also has a hand in it. Whatever the precipitating factors, the upheaval is a costly one. People are dying, borders are being redrawn, and the dragon's teeth of discord are being sown for generations to come. During the modern era, the Middle East has experienced three distinct waves of remapping and population transfer. The first came at the end of World War I with the collapse of the Ottoman Empire and the creation, from its corpse, of the modern state of Turkey and a jumble of colonial mandates. The second wave came with the withdrawal of the European powers in the 1930s and 1940s, which produced the modern versions of Iraq, Lebanon, Syria, and Jordan. And in 1948, the creation of the state of Israel out of what had once been a British protectorate drew millions of Jews from around the world to the new country and at the same time dispossessed millions of Palestinians in the Nakba (the “catastrophe”). 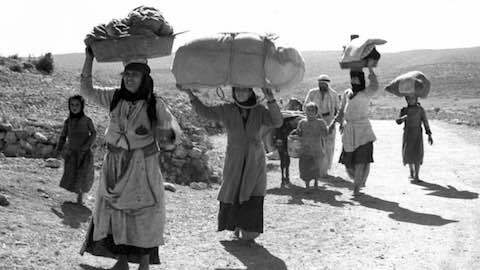 Today, the entire region is experiencing a Nakba as the third major remapping of the Middle East in modern times gets underway. The states that we have taken for granted for so long -- Iraq, Syria, Israel, Egypt, Saudi Arabia -- are being transformed. The chain of events set into motion by the U.S. invasions of Afghanistan and Iraq is inexorably reaching its logical conclusion -- not the consolidation of democratic, secular states but the disintegration of multi-ethnic and multi-confessional entities. Nationalist forces have squared off against religious extremists over not only who controls the states of the region, but the very nature of the state institutions. Meanwhile, outside powers have poured arms and money into the region in quixotic attempts to influence the outcome. Many people aren’t sticking around to see who will win. They’re voting with their feet. Millions of refugees, mostly from Syria but also from Afghanistan and Iraq, are pouring into neighboring countries. The shortfall in funds available to manage this refugee flow -- and the resulting lack of food and health care in the refugee camps in Jordan and Lebanon -- has precipitated a follow-on wave of emigration, mostly to Europe. The states of those strife-torn countries have failed their denizens, so they’re seeking out places where the state provides at least partial shelter from everyday violence and uncertainty. In an equally startling development, tens of thousands are going in the opposite direction. The Islamic State has attracted nearly 30,000 people in the last two years. Given an inflow of 1,000 new recruits each month, the entity is able to maintain its fighting strength of 20,000-30,000 zealots, despite having absorbed 7,000 air strikes and suffering an estimated loss of 10,000 members (or perhaps because of these well-publicized martyrdoms). Although the recruits all subscribe to the same version of Sunni Islam, their decision to flock to ISIS is more like the earlier, more ideologically motivated migration to the Soviet Union. After all, if they simply wanted a more fundamentalist version of Islam, they could have gone to Saudi Arabia. Rather, they’re drawn by the ISIS promise to fuse religion and state authority in a new caliphate. At the same time deeply conservative and thoroughly revolutionary, ISIS promises to change the world by plunging it back into a Dark Ages of beheadings and Twitter. The current refugee crisis is the most visible sign of this Middle East remapping. But it’s not the only one. Both the United States and Russia are committed to bolstering unitary states in the Middle East. They just happen to support different ones. Russia has long backed the government of Bashar al-Assad. It’s recently attempted to portray the Syrian regime as the best chance for defeating ISIS. Russian President Vladimir Putin has sent advanced jet fighters and a contingent of soldiers to battle a force that’s already declared its own satellite state on Russian soil in the northern Caucasus. This week, Russia conducted its first aerial attack on ISIS in Syria. President Obama, at the UN summit this week on countering ISIS, has pushed for a “hearts-and-minds” strategy to counter violent extremism at the source. But the United States is also bombing ISIS, supporting opposition fighters like the Kurds, and trying to train “moderate” fighters to insert into the conflict (a dismal failure to date). The likely outcome of this strategy will be an accelerated fragmentation of Syria. The Kurds, Druze, Sunnis, and Alawites are spinning apart in the country's centrifuge of violence, and the efforts of the U.S.-led coalition to oust Assad and defeat ISIS will drive the wedges even further between these communities. Meanwhile next door, evidence of the failure of this strategy is on display in Iraq. Years of war have not produced peace or eliminated extremism. The Obama administration has tried to keep Iraq together through an ill-advised patchwork of alliances that have only compromised the country's immune system, giving rise to the potentially terminal illness of ISIS. And Washington continues to look the other way in Iraq as Shi'ite militias engage in their own form of ethnic cleansing, using ISIS as an excuse to go after any and all Sunnis in the country. Syria and Iraq are not the only countries drifting toward a terrifying homogeneity. The Christian population of the region has declined to a mere 4 percent -- from 1.5 million in Iraq to 500,000 today, from a strong majority in Lebanon to a mere 34 percent. Sectarian violence has also threatened Coptic Christians in Egypt and Libya. If ISIS takes root in these countries, countless other minorities would be at risk as well. Saudi Arabia, meanwhile, has a significant minority population of Shi'ites, somewhere between 10 and 15 percent, who have faced persistent discrimination. The most recent case involves Ali al-Nimr, whom the Saudi authorities arrested four years ago when he was 16 for his participation in protests against anti-Shia discrimination. The Saudi government plans to behead him and then crucify the body as a warning to others. Who needs enemies with friends like these? And then there's Israel, which has done as much as possible to isolate Palestinians in the Occupied Territories and treat its Arab population as second-class citizens. The situation inside Israel has become so toxic that even Sayed Kashua -- the most successful Palestinian writer in Israel -- moved his family to Champaign, Illinois. A two-state solution that finally accords Palestinians their own functioning state is to be welcomed -- but it’s also a sad recognition of the inability of Israelis and Arabs to live in a multiethnic society together. Finally, with the fall of Kunduz to the Taliban this week, Afghanistan too is on the verge of following Iraq and Syria into a nation-state death spiral. A city of 300,000 people, Kunduz is the first urban area that the Taliban have seized since their defeat in 2001. If the Taliban retake power, expect the country to surpass Syria and once again become the world's leading exporter of people, with minority populations suffering disproportionately. Russia has already assembled a coalition with Iran, Iraq, and Syria to share intelligence for the purposes of battling ISIS. If the United States and Russia were to put aside their differences to pursue a political solution to the problems facing Syria in particular, it would go a long way toward achieving the consensus necessary to address what ails the Middle East. But it's not enough. The problem of the Middle East is not something that outsiders can fix. The essential problem involves the nature of the state. The various state models on offer in the region are just not working. Authoritarian Arab nationalism, represented by Assad in Syria and al-Sisi in Egypt, is a human rights nightmare. The theocratic alternatives on display in Saudi Arabia and Iran are equally unpalatable, though at least some democratic procedures are in place in the latter. The sultanates of the Gulf States depend on cheap foreign labor and a caste system to keep the ruling families in place. Israel, too, has created an apartheid system to keep itself afloat in a largely hostile environment. Lebanon's confessional system has been paralyzed for years. Iraq was supposed to be the model that all post-9/11 countries in the region should follow, but it's barely a state at all given the autonomy of the Kurds, the secession of ISIS, and the murderousness of the Shi'ite militias. Turkey once offered great hope as a compromise between the religiously observant (the Justice and Development Party), the secular nationalists (Kemalists), and the minorities (particularly the Kurds). But that model has broken down because of President Recep Tayyip Erdogan's desire for power. Outsiders can't impose a state system, as the colonial powers attempted to do after World War I or the Bush administration tried in Iraq after 2003. But they can help reduce the amount of violence in order to create space within which the critical discussions over what kind of state is appropriate can take place. President Obama spoke once again at the UN about the importance of political solutions. Fine: Let's stop focusing on the one (Assad) and refocus on the many (the refugees). Sit down with Russia, Iran, the EU, and others to work out a political solution in Syria that can stop the ongoing population transfer and avert an even greater tragedy. "The Middle East's New Nakba"